For many girls, a wedding is a celebration of a lifetime, and everything should be perfect and luxurious on it so that not only newlyweds but also invited guests will remember. The choice of flower arrangement for the bride does not stand aside. Habitual roses are no longer popular, and other fresh flowers come to replace them. Choosing flowers for the most important day, the girls can not immediately decide, because they are all beautiful and each carries its own specific role. Lilies are suitable romantic persons; bright, catchy plants will be an excellent addition to the same young ladies. Among the usual, field flowers you can choose those who can become a worthy accessory on this solemn day. Chamomile – a delicate wildflower that symbolizes youth, love, carelessness, and simplicity. His gentle coloring is perfect for the bridesmaid dress. A solemn bouquet of daisies can be assembled from various additional plants, including flowers. 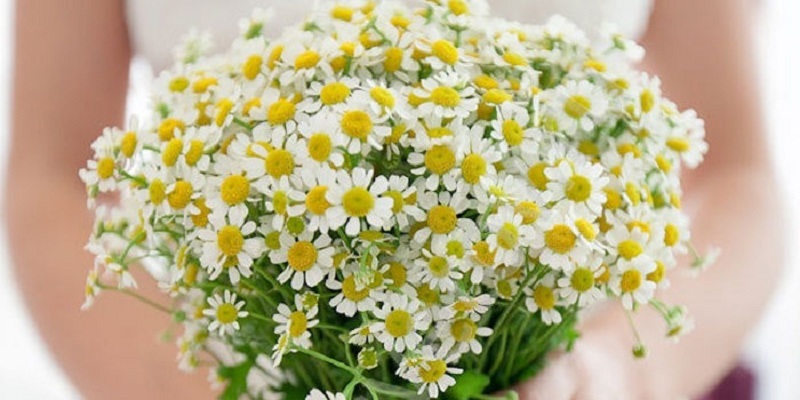 Florists have long used chamomile in their works because this flower is refreshing, makes the whole composition surprisingly easier, and what can even better suit a young girl? Options to collect compositions from this inflorescence are many. If you go to a good salon, you will be offered surprisingly beautiful combinations with peonies, gerberas, tulips, that even it will be difficult to choose one. If you are a fan of organizing your own holidays up to the smallest detail, then you will not be able to make a festive composition. The following examples will help you to make a choice, suggest how best to combine beautiful field inflorescences, which, due to their simplicity, can emphasize any solemn image of the bride. For a romantic, gentle person or a wedding in the country style is ideal a large bouquet of daisies with the addition of blue cornflowers. Both plants are field plants, so they will look beautiful in the hands of the bride in a light white dress. If you decide to celebrate your wedding in the open air, then this is another reason to collect such an air, but at the same time, a colorful decoration collected in the field. The bridegroom can also insert several inflorescences into the butannier to be on the same wave and image with his beloved. Very often, the newlyweds try to pick up all the accessories for the celebration in one color, so if you stop at blue, then cornflower is what you need. It will look great at a nautical theme wedding or in Russian style. To collect such a composition can be both independent and ordered from florists. It is possible to combine simple field inflorescences with majestic classic roses, the main thing is to choose the right color and additional plants. It will look very nice tea, yellow, white inflorescences with large buds. In no case do not pack such delicate wedding bouquets of daisies and roses in cellophane, leave everything in its natural form, just tie it with a beautiful rope. To prevent the fingers from scratching, it is better to insert them closer to the middle of the composition. 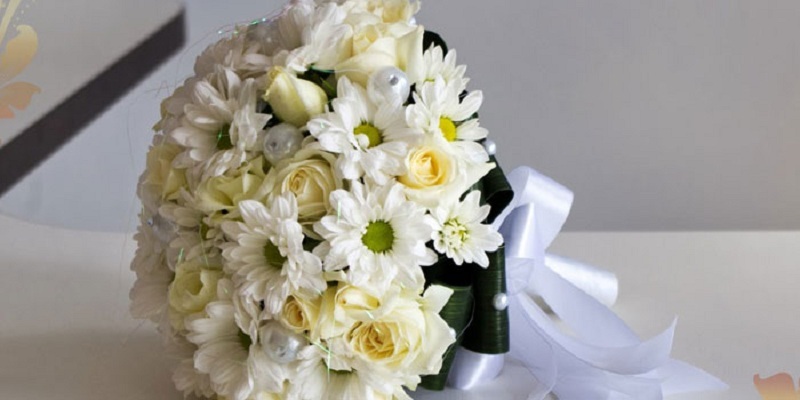 Such a beautiful bouquet of daisies will be a luxurious addition to any white dress of the bride. As well as bright Vasiliki, blue or lilac eustoma (also called lisianthus), a charming flower that often serves to decorate stylish compositions, will be a pleasant addition. It is often used to dilute white, cream flowers, giving brightness to several branches. To assemble a small, elegant bundle, carefully choose the size of the eustoma: it should not be too large so as not to stand out from the general picture. Such a composition will look good as a round shape and in a simple high version. 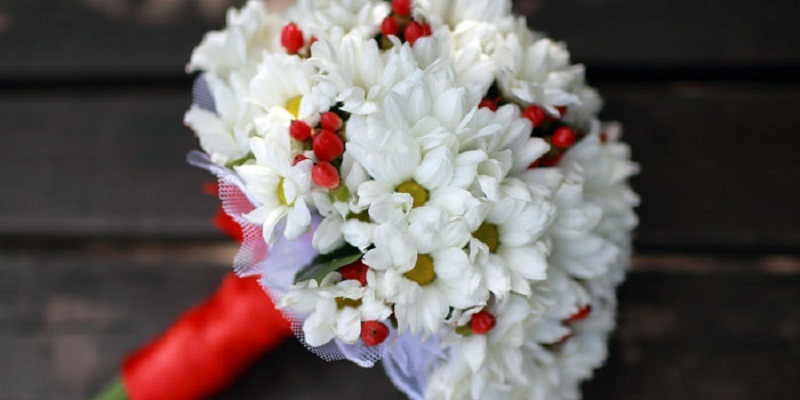 A huge bouquet of daisies, giving a special charm, can be diluted with chrysanthemums. The price for them is not very high if ordered in the cabin, but you can go to the field on your own and collect your favorite plant twigs. Chrysanthemums are often planted in summer cottages, so if you have a planned ceremony at the time when they begin to bloom, then you can easily collect the beautiful composition from what you find in yourself or friends on the site. Chrysanthemums are the same color – white with yellow. The main difference from the field – the size of the flower itself. It is often larger, so in combination with small chamomile flowers, it will look very good. 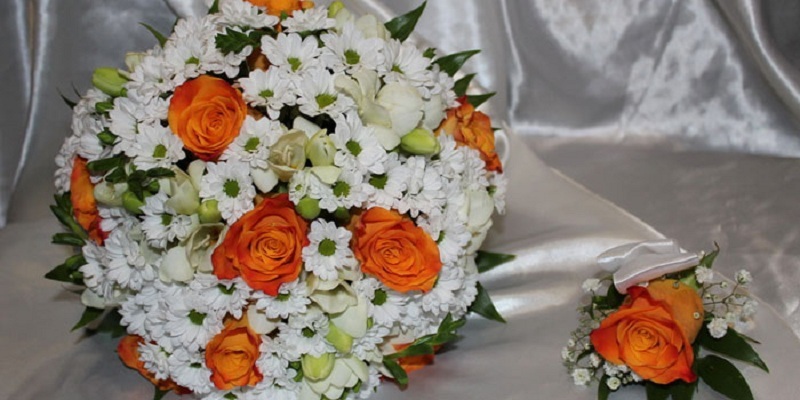 Such a wedding arrangement will be a gentle addition to the dress and will not stand out from the overall picture. Perfect for blondes and fair-skinned girls. Stylish, bright gerberas will be perfectly combined in the composition. Large inflorescences will look good in any shades, even dark red. 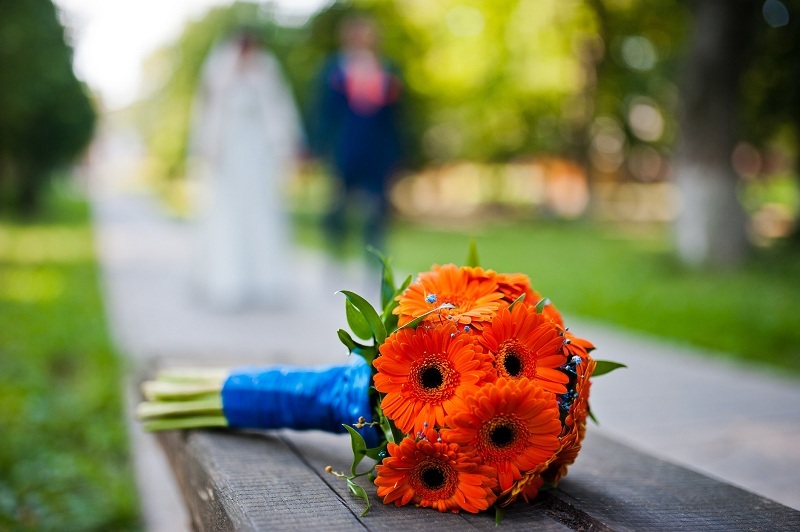 It is possible to insert one gerbera of the same color as in the wedding bouquet of the bride into the groom’s butanierka. If you are a brave brunette, then this option will suit you. 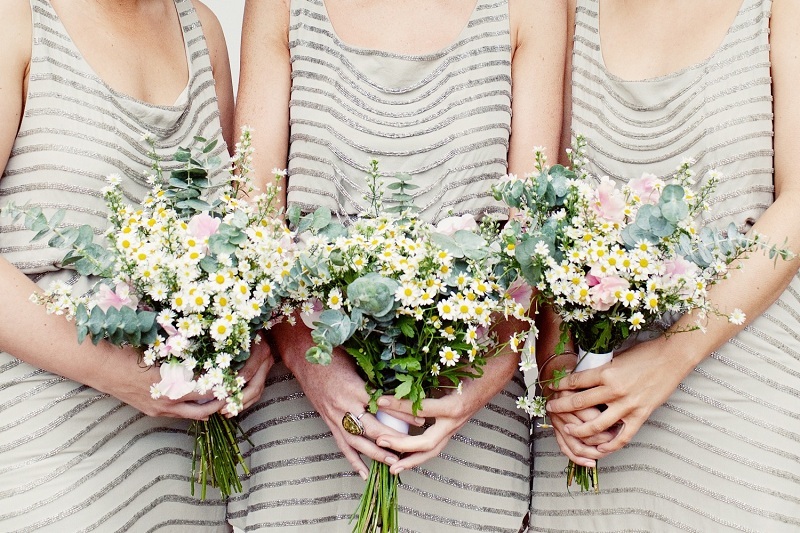 Enough 3 gerbera on 5 branches of daisies and your bouquet is ready! Additionally, you can decorate it with a mesh, organza, satin ribbons or even a thin flail. It all depends on what style your ceremony and outfits will be. Look good gerberas in sequins. So they give the whole composition an even more solemn look. Rhinestones, sequins and even a lacquer with sparkles that fits perfectly on petals and lasts for a very long time. 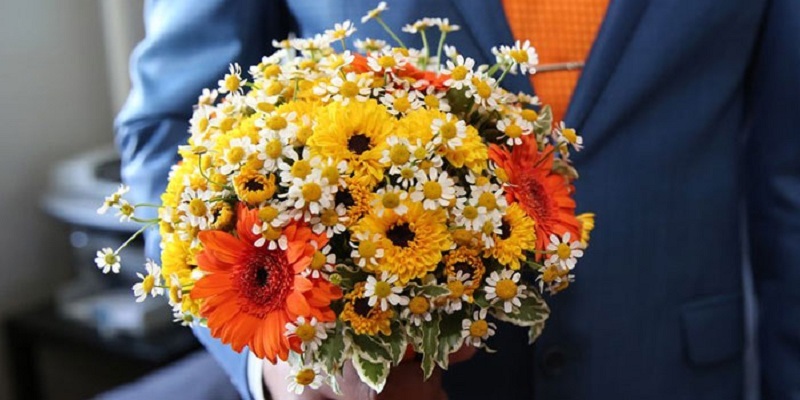 Many girls do not want to order bouquets with daisies, because they are confident that they themselves will be able to cope with this task by purchasing the necessary flowers. In what they are right, especially if they have a taste and know how to combine flowers. Otherwise, it will be better if you trust the masters who will collect you a stylish composition, and it will not be expensive to cost. Buy a few twigs of a flower (7-9 pieces), a yellow satin ribbon, and pearl beads to decorate the trunk. Collect the composition starting from the center. Fasten the stems with a thread, and then thread well along the trunk (but leaving 3-4 cm of tails) with adhesive tape so that the flowers do not break up. Wrap the barrel with adhesive tape so that the adhesive side is outside. Wrap the trunk with satin ribbon. You can decorate the ribbon with pearl beads by carefully stitching them.